Ayr is a town and locality in the Shire of Burdekin, Queensland, Australia. It is the centre of a sugarcane-growing region. In the 2016 census, Ayr had a population of 8,281 people. Ayr is located 88 kilometres (55 mi) south of Townsville on the Bruce Highway and 12 kilometres (7.5 mi) away from the (smaller) town of Home Hill. It is 112 kilometres (70 mi) north of Bowen and 290 kilometres (180 mi) north of Mackay. Ayr is located near the delta of the Burdekin River. It is within the Burdekin Shire, which produces the most sugar cane per square kilometre in Australia utilising underground water supplies and water from the Burdekin Dam to irrigate crops when rains fail. Alva beach, also known as Lynch's Beach, a popular area for fishing and swimming, is located 16 kilometres (9.9 mi) east of Ayr. Ayr is believed to be named after the Scottish town of Ayr, the birthplace of Queensland Premier Sir Thomas McIlwraith. Ayr Post Office opened on 25 August 1883. Ayr State School opened on 15 November 1886. In 1928 it was expanded to include a secondary school. In 1937, the secondary school became a separate entity, Ayr State High School. East Ayr State School opened on 8 August 1952. Ayr Opportunity School opened for children with disabilities in 1972. It was renamed Burdekin Special School in about 1985. In 2001 the name was changed to Burdekin School. St Francis Primary School opened in 1912 operated by three Sisters of the Good Samaritan. Burdekin Catholic High School opened on 1 April 1974 in the Marist tradition. The Ayr War Memorial Arch is the entrance to the Memorial Park and commemorates those who served in World War I. It was dedicated in November 1925 by the shire chairman, Councillor Barsby. In June 2018, the town become the centre of controversy when a racist poster was placed up in one of the shops, telling foreigners and backpackers that they're not welcomed. Within hours, Burdekin Shire Council Mayor Lyn McLaughlin condemned the people responsible for the poster. According to the 2016 census of Population, there were 8,281 people in the Ayr urban centre. Aboriginal and Torres Strait Islander people made up 7.7% of the population. 82.4% of people were born in Australia. The next most common country of birth was Italy at 2.1%. 85.4% of people only spoke English at home. Other languages spoken at home included Italian at 2.8%. The most common responses for religion were Catholic 37.3%, Anglican 15.7% and No Religion 15.0%. Ayr has several state primary schools (Ayr, East Ayr, Kalamia and several others in surrounding areas) and two non-government primary schools, St Francis School (Catholic) and Burdekin Christian College. Ayr State School opened on 15 November 1886. Ayr has one state high school and one non-government high school. Ayr State High School was the 8th public secondary high school in Queensland. The non-government high school is called the Burdekin Catholic High School. Ayr is home to a small, state owned hospital. The one-storey building offers basic emergency care. The hospital features a helipad, which is utilized during more serious emergencies. The A1 passes through the town. This, mostly two laned highway, is the major road of the Burdekin. It links Ayr with neighboring Brandon and Home Hill. Ayr's main street, Queen street, is a wide two laned street capable of handling a large amount of slow travelling cars. Ayr Railway Station is the town's rail transit stop. Regular services run from Brisbane to Cairns. While the town has no public transport, several bus routes pick up school children across the region. A wide variety of sports are played in Ayr, including Touch football, Rugby league, Rugby Union, Soccer, tennis and golf. Netball and Table Tennis (ping pong) are also popular. The Ayr Surf Life Saving club is a small yet highly established club. Ayr is home to one newspaper. The Ayr Advocate has a Burdekin-wide circulation of just under 4000 people. The paper is published by Sydney-based News Corporation, and has three full-time journalists. The town is home to the centre-right satirical publication The Burdekin Herald which was launched in 2013. In January 2014 the Burdekin Herald published an article claiming that the conservative Queensland government was going to introduce 22 000 poisonous snakes into homes to rid the state of cane toads. Ayr has the usual chain stores, including Domino's Pizza, ten pin bowling, a toyshop, cinema, six pubs, and a range of sports, electrical and fashion stores. Ayr has several banks including the Commonwealth, ANZ, Suncorp, National and Bendigo Bank. The Burdekin Shire Council operates a public library in Ayr at 108 Graham Street. Burdekin Library opened in 1984. The Ayr branch of the Queensland Country Women's Association meets at 20 Chippendale Street. Karrie Webb: professional golfer, member of LPGA Hall of Fame. ^ a b c Australian Bureau of Statistics (27 June 2017). "Ayr (Urban Centre/Locality)". 2016 Census QuickStats. Retrieved 23 January 2018. ^ a b "Ayr - town in Shire of Burdekin (entry 1066)". Queensland Place Names. Queensland Government. Retrieved 18 March 2014. 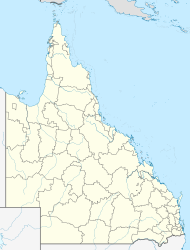 ^ "Ayr - locality in Shire of Burdekin (entry 49421)". Queensland Place Names. Queensland Government. Retrieved 18 March 2014. ^ "Lynchs Beach". Burdekin Shire Council. Archived from the original on 6 September 2018. Retrieved 29 September 2018. ^ "Overview". St Francis School, Ayr. Archived from the original on 4 October 2017. Retrieved 4 October 2017. ^ "Principal's Welcome". Burdekin Catholic High School. Archived from the original on 4 October 2017. Retrieved 4 October 2017. ^ "NEWS OF THE NORTH". Cairns Post (Qld. : 1909 - 1954). Qld. : National Library of Australia. 27 November 1925. p. 9. Retrieved 6 April 2014. ^ "War Memorial Arch". Monument Australia. Archived from the original on 7 April 2014. Retrieved 6 April 2014. ^ "Backpackers furious over explicit poster". Archived from the original on 29 September 2018. Retrieved 29 September 2018. ^ "Ayr Post Office (Place ID 106172)". Australian Heritage Database. Department of the Environment. Retrieved 29 September 2018. ^ "Ayr Court House (entry 601126)". Queensland Heritage Register. Queensland Heritage Council. Retrieved 7 July 2013. ^ "Ayr State High School (entry 601574)". Queensland Heritage Register. Queensland Heritage Council. Retrieved 7 July 2013. ^ "Burdekin Shire Council Chambers (entry 601922)". Queensland Heritage Register. Queensland Heritage Council. Retrieved 7 July 2013. ^ "Kalamia SS". Archived from the original on 2 February 2017. Retrieved 29 January 2017. ^ a b "Opening and closing dates of Queensland Schools". Queensland Government. Retrieved 18 April 2019. ^ "'Government to introduce 22 000 Black Mambas to help eradicate cane toads' Article is Satire". 24 January 2014. Archived from the original on 4 March 2016. Retrieved 4 October 2017. ^ "Satire - 'Black Mambas to Help Eradicate Cane Toads'". www.hoax-slayer.com. Archived from the original on 15 March 2018. Retrieved 4 October 2017. ^ "Burdekin Library Public Libraries Connect". Public Libraries Connect. 26 July 2017. Archived from the original on 1 February 2018. Retrieved 1 February 2018. ^ "Queensland Public Libraries Statistical Bulletin 2016-2017" (PDF). Public Libraries Connect. November 2017. Archived (PDF) from the original on 30 January 2018. Retrieved 1 February 2018. ^ "ABC OPEN: The Bond || From Project: My Back Roads". Australian Broadcasting Corporation. Archived from the original on 12 May 2018. Retrieved 29 September 2018. ^ Thomas, Hedley (25 September 2015). "Life mission accomplished". The Australian. Retrieved 29 September 2018. ^ Macdonald, Ian. "Dr James Raymond Bourke, MG, AM". Senator Ian Macdonald. Archived from the original on 29 September 2018. Retrieved 29 September 2018. ^ Eatgate, Ross (February 2017). "Jim Bourke - Remembering a one-off, larger than life character as I recall him". Alliance of the Defence Service Organisations. Archived from the original on 29 September 2018. Retrieved 29 September 2018. ^ "BOURKE, James Raymond". Virtual War Memorial. Archived from the original on 29 September 2018. Retrieved 29 September 2018. ^ Whiticker, Alan & Hudson, Glen (2005). The Encyclopedia of Rugby League Players - Wests Tigers. Melbourne, Victoria: Bas Publishing. pp. 191–192. ISBN 1-920910-61-1. Wikimedia Commons has media related to Ayr, Queensland. Wikivoyage has a travel guide for Ayr (Queensland).